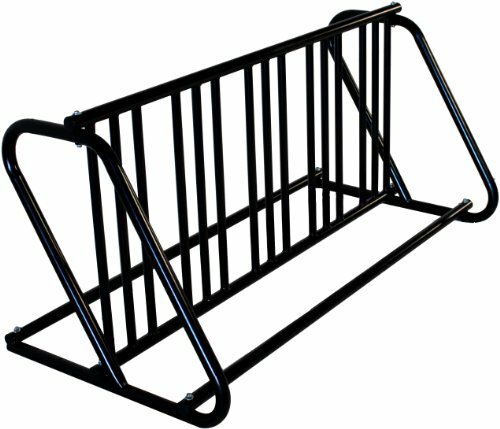 The Hollywood PS10 “dual use” systems can be assembled as either a maximum capacity “double sided” 10 bike parking rack or a space saving single sided 5 bike parking rack. Featuring heavy duty welded steel construction and a “park equipment” grade exterior finish, these racks are suitable for both commercial and residential use. Includes anchor holes for bolting to concrete, and can be connected to adjacent units with optional accessory. Fits both wide and narrow tire sizes, and is easily assembled. ED-Zinc undercoat plus “park equipment” grade powder coat finish. Grid and side rails are welded. 1 1/2 inch x 14 gauge steel side rails and horizontal tubes. 1 inch x 16 gauge steel vertical tube.